I’m sorry, I couldn’t resist. What other catchy title could I use for a post about capers? Just Capers sounded really boring, Caper-bility Brown was the wrong colour and Tossing The Caper sounded a bit rude. Enough of that, let’s seize the capers and get on with this post. Rather like the salt cod that I wrote about previously, I have a feeling that capers are something you either love or loathe. For me, they are a culinary essential. They get hurled in to pasta sauces, added to pizza toppings, used in sauces for fish, or just as they are, fresh from the jar served with drinks. This little corner of Spain is truly The Garden Of Eden. Hardly a month goes by when there isn’t some sort of free food growing. The last bounty we gathered from the groves was wild asparagus, now it’s the turn of the thorny caper bushes to yield their magnificent bounty. Before moving to Andalucia, I must admit to giving very little thought about where these green berries came from. Considering that over the years I must have bought hundreds of jars of them, I’m a little ashamed to say that it never occurred to me to look up where they were from, aside from Sainsburys, 4th aisle on the left. I’d guessed that they weren’t native to The British Isles and that they probably were from The Medditerannean region but that was about it. And then, one August morning almost three years ago, I was walking down a lane here in the village and an absolutely beautiful smell wafted through the air. I glanced around and saw some delicate flowers growing from a creeper like bush. Despite my bending down to sniff the flowers,the penny still didn’t drop. Fortunately the plot thinned when the following summer I noticed that my neighbour had some jars of capers lined up on the wall outside her house. She’d been picking them that morning and I asked her where I could find them as I rather fancied pickling my own. July and August are the caper months. 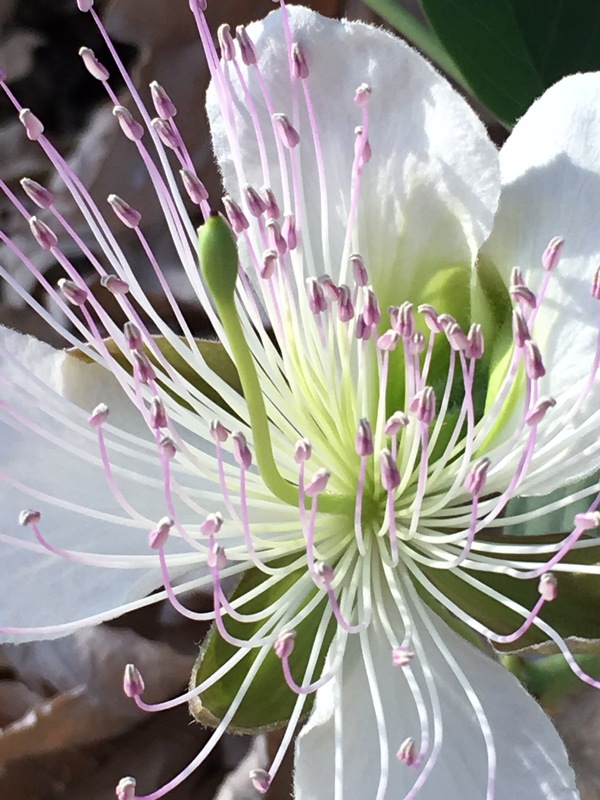 The plants are easy to spot as they have gorgeous fragrant flowers and grow in the driest soil. They particularly like walls and the edges of roads and tracks – the wilder and dustier the better. Early morning is the time to pick them and unless you want Caperberries, pick them when they are about pea sized. 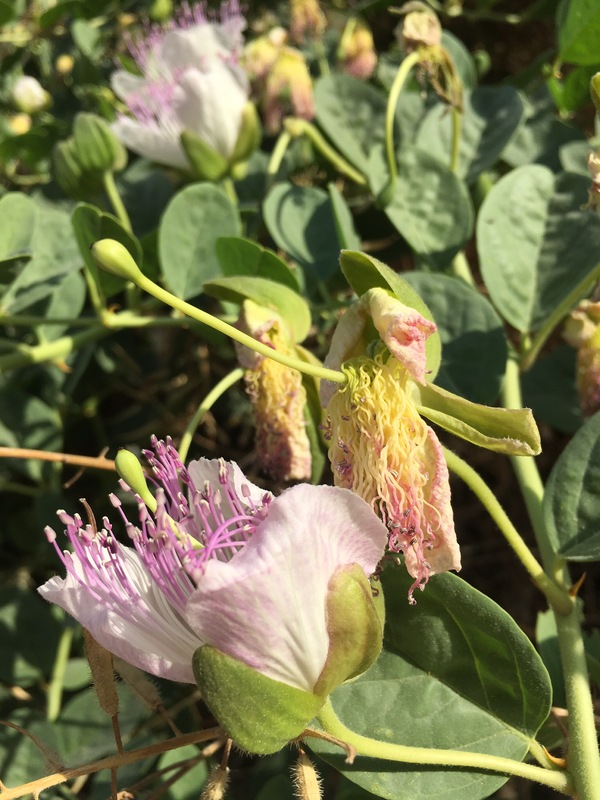 The caper grows from the inside of the flower so don’t get confused like I first was by the unopened flower buds. For the brine you need half a cup of vinegar, half a cup of water and a tablespoon of salt. The capers need to be submerged in the brine solution so make sure you have enough liquid to cover them. Maria leaves hers out in lidded glass jars in the sun for about two to three weeks to cure. They are then stored in a cool dry place and will keep for at least a year or more if left unopened. I’m very chuffed that I’ve ‘learnt’ you something today 😉 Have a look at the wiki link at the bottom of the post – I”m pretty sure that it mentions something about having the right soil. From what I can see, the poorer the soil the better. They seem to thrive in the driest of places and cope with the heat very well. They do smell absolutely divine, a bit like honeysuckle but they have prickly branches and the flowers are short lived. Yes, incredibly it is almost three years ago that I came here for the whirlwind house hunting trip from Jakarta. We moved over here in late October. Time has flown! Thanks so much, Lottie. I’d never seen the plants either. Ah, by the way. My mother and I tried the orange and cod salad and is a beauty. Thanks! I’m tickled pink and VERY happy that you and your mother enjoyed the salad! Whoo Hoo! Hooray! and good for you for giving it a whirl. Lottie, this was a great learning post. I always thought that capers were grown in France or maybe Italy. I just never got around to looking it up. I have a small jar in my cupboard al all times. The sprawling bush sounds like a plant to grow in the garden. It is quite lovely. Anyhow, I just discovered that you have changed your blog and apparently I have been out in left field since January. I have missed posts but I shall be returning so that I can read and comment. I might have even have commented or maybe not and just forgot the new look. Hello! I haven’t changed my blog for ages, Yvonne. I think sometimes that blogs we follow don’t get sent to email or things change -either way, it’s not a problem and I’m happy that you got here today. I know that you’ve had a lot on your plate and I’ve been meaning to email you for weeks, sorry 😦 please, please don’t worry about catching up with my posts, I’ve not posted much this year as so much going on, I doubt you’ve missed any to be honest! Thanks Lottie,. but I do believe I missed a post and I want to rectify that. Dear Lottie — fun, educational, lovely, and tasty! I really enjoyed this post. I love capers, but knew nothing about them. 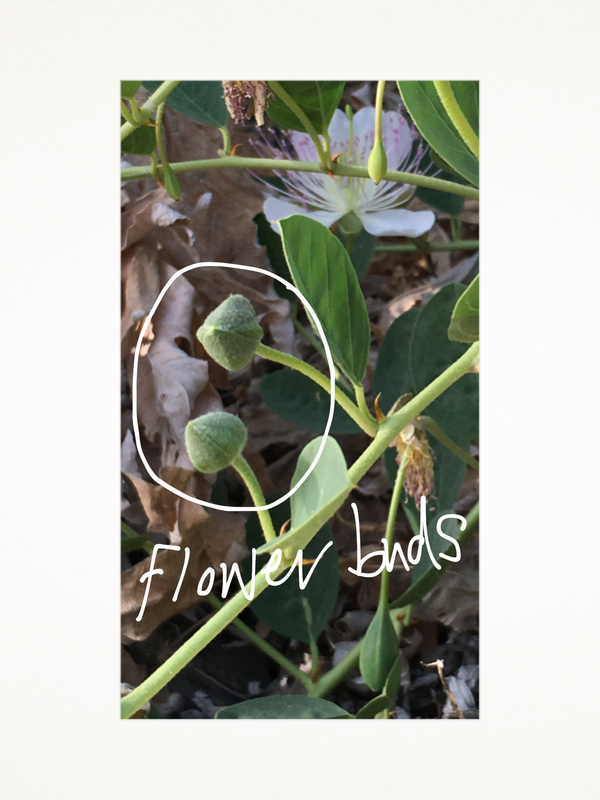 I was fascinated by the pictures of the buds vs berries. How would have expected them to come with such beautiful flowers! You painted such a marvelous picture for me — thanks for a lunch-break in your beautiful corner of the world. Caper diem indeed! Mega hugs. I love capers! Both the salty and adventurous types! The flowers are gorgeous. 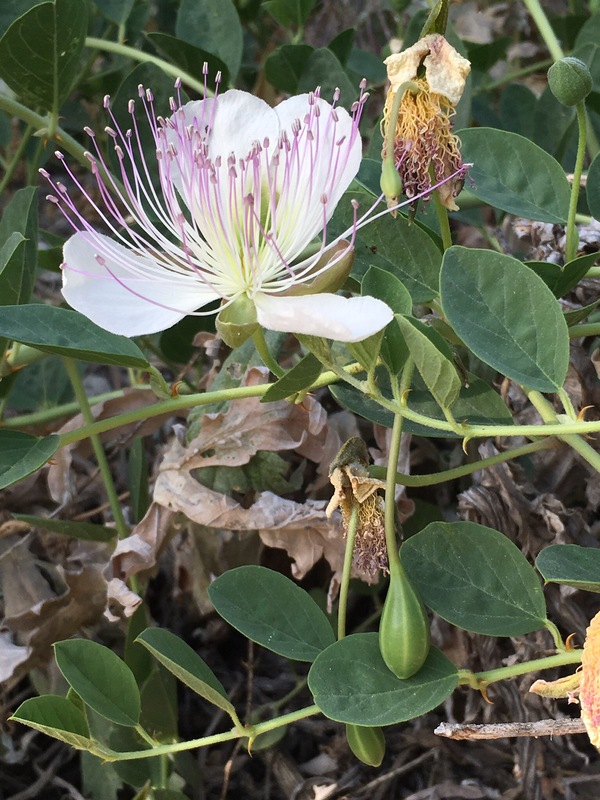 I would have never guessed that these were caper plants. Like your previous incarnation, I only know that the jars of capers are in the produce isle of my local market. Hah! How very cool to be able to pick and brine your own. The blossoms are stunning too 🏵 I’m glad you moved to Spain, so I know all about the caper now 🤓.. Thanks Lottie!! I never researched where capers came from. I’m surprised they grow out of a flower. Very cool, thanks for sharing via photos, Lottie. I throw capers into my tuna salad, along with kalamata olives and diced apple. The sweet and salty make a great combination! 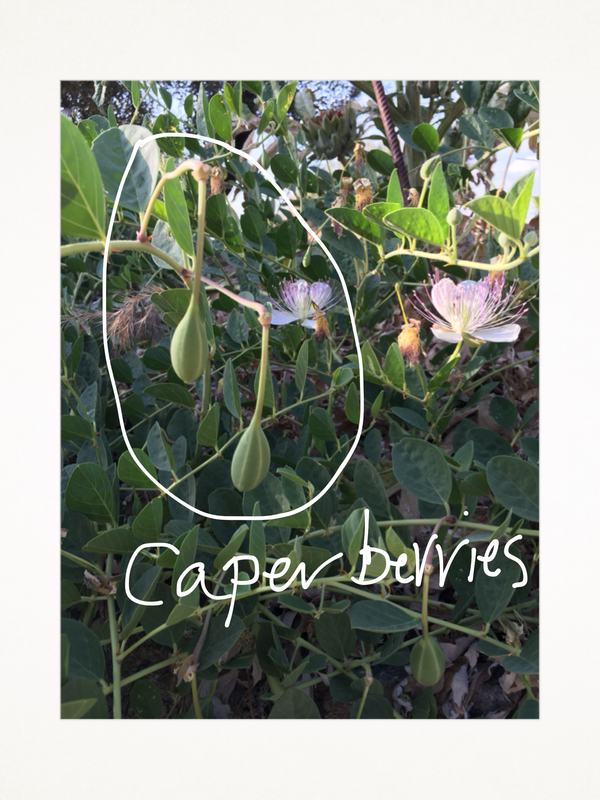 Capers should be growing wild here too, but I have never come across them in Australia. Helvi sometimes use them in salads or in chicken dishes. I suppose they could be used anywhere, even in a curry or potato bake. Not so sure about them in a curry but certainly potatoes could make a good marriage. I wonder why they don’t grow in Australia? Maybe its something to do with the soil? Our summers are baking here, up to 46C but -7c at night in the winter so they must be pretty hardy to survive such extremes of temperature. I might have to do a bit more research. P.S haven’t forgotten your book, I’m still desperate to read it but I’m having to hold on another month or two until we’ve paid all the builders and electricians etc. Nail biting times financially! Amazing flowers! I didn’t have an inkling either. My little boy is being shown the photos as we speak-he loves capers! Thank you Lottie, for this marvelous information. Oh what a caper lovely lady. I can just imagine you ‘capering’ down the little lanes there collecting and then bottling. I always thought they were bits of fish so I knew less than you. I am the man in the middle…I neither love nor loathe ’em and don’t mind finding capers in a dish. I never thought about where capers came from either. Wish I had some plants here in Indiana so I could pick on my own. ← Orange Salad – A Culinary Ray Of Sunshine.